Peddler Night Market & Akin Clothing are joining together to bring live music, live street art and street food to 92 Burton Rd this weekend (26-27 October). 100% of profits raised from sales of drink, clothing and artwork will helping to provide for education facilities for children in developing countries where families can’t afford to buy the uniforms required to send their children to school. 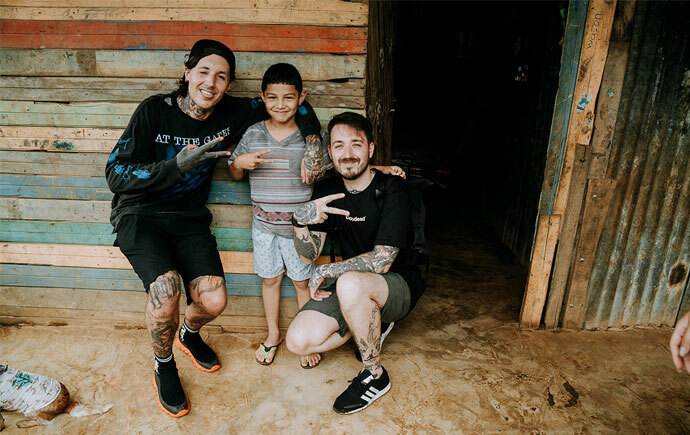 Akin Clothing collaborated with Drop Dead earlier this year to help children in Costa Rica. Founder of Akin Ben Howells said: “The team behind Peddler have been beyond amazing with us, they offered to help even more kids around the world and that’s what Akin & Friends is all about. They’ve been incredible to work with and said we could set up our office inside their building in Kelham Island. During the event, street artists will collaboratively paint a huge wall together, which will later be broken up and sold via a silent auction on Saturday. There’ll be artwork for sale by artists including Kid Acne, plus Tom Sykes’ photos of their visit to Costa Rica will also be on show. This event takes place on Friday 26 October 5-11pm and Saturday 27 October 2-11pm. For more information head to akinclothing.com, peddlermarket.co.uk and dropdead.co.